Coach Jeff Walz has turned the Louisville Cardinals into an elite team since taking the helm of the program in 2007. Photo by Adam Creech. 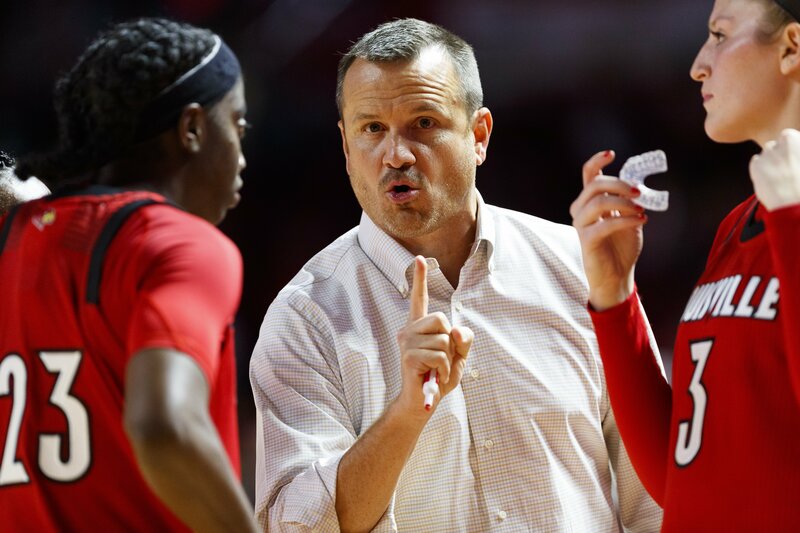 Jeff Walz was named Louisville’s head coach in 2007, and in his rookie season he guided the Cardinals to a program-first Sweet 16 berth in the NCAA Tournament. The following year Louisville were NCAA Division I runners up at the Final Four. Since then the Cardinals have been to the round of 16 seven more times, the Final Four twice more, and the title game once more. Walz began the season with a 299-96 record at the school, including a program-record 36 wins last year. Three of his players have been decorated All-Americans, 29 all-conference, and six have been drafted into the WNBA. A Kentucky native, Walz was an assistant coach at Maryland for five years and helped guide the Terrapins to the 2006 National Championship before coming to Louisville. He began his collegiate coaching career as an assistant at Western Kentucky, and also made stops in Nebraska and Minnesota. A two-year letter winner at Northern Kentucky, Walz coached high school and AAU basketball after college, and coached his sister Jaime, who was the 1996 National Prep Player of the Year. Walz and his wife are the parents of four children. You quickly did what takes most coaches much longer to accomplish in their first head coaching job: you took over a program and guided players that you hadn’t recruited into quick success. How were you able to do this? I tell people all the time that I was very fortunate. I didn’t take over a program, as traditionally most do, that had lost a lot. I took over a program where Tom Collen had done a nice job, and he just decided to take the job at Arkansas, where he was from. I inherited Angel McCoughtry. 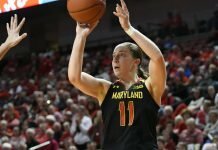 I already had a relationship with her because she was from Baltimore, and she came to games when I was at Maryland and we were recruiting her. So when I got the job it wasn’t a complete shock. Angel’s telling the other players, ‘he’s good, this guy’s good.’ Sometimes when you’re a new head coach you have to prove yourself, and I didn’t have to do that. It was a two-day interview process, and some players were part of the panel. We got to a point and we talking about the recruits who had been signed. I asked, ‘how many of you have called those recruits?’ and none of them had. I said, ‘the problem is that you’re just thinking of yourself. Not one of you have reached out to them.’ The next day, the second day of the interview, (then-junior) Patrika Barlow told me she had called all of them. So it started from there. If you can just change a mindset and get them to believe, you’ve got something. You were off and running before you even got the job. We don’t have a bunch of rules. If you act like an adult, we’ll treat you like one. If you don’t know, we’ll teach you. Every kid I’ve ever recruited, they know right from wrong. It’s if they’re willing to do what’s right, because that’s not always the easiest way. I changed the culture and changed the accountability. Insead of the coach just being the one to do things, I had players take accountability. For example, I told them: rank from top to bottom every player on the team. Of course, they will put their friends third or fourth. Then I say, do it for one million dollars, and their friend goes to number 11. I tell them, you’ve got to not look though the friendship goggles. I can’t say our goal was to win a National Championship, but every player who’s played for us has played in the Final Four. We’ve got the right kids. When you get to March, the best team doesn’t always win. We beat Baylor that one night (in 2013), but if we had to play them in a WNBA-type best of seven, that might have been our only win. What were your X’s and O’s steps in building the program? I worked for Paul Sandeford at Western Kentucky and Nebraska, and during that time three of those teams went to the Final Four. He was a good of a basketball mind that I’ve ever been around. He paid attention to defense. Everyone would ask him, ‘what’s your defensive philosophy style of play?’ and he’d say, ‘my philosophy is to win games.’ If you watch us play we will switch (zone); it depends on personnel. Asia Durr is a perimeter player but has a great inside game. We’re very versatile. What are the characteristics of Louisville basketball? We take a lot of pride in our toughness – we will continue to fight for 40 minutes. I tell the kids to not play the scoreboard, play the clock. We take a lot of pride in trying to score the basketball. I don’t want to watch a game that’s 47-45. There are five to six possessions in the men’s game where there’s an alley oop done. But a 47-42 game is not a good basketball game. We normally end up defending pretty well, but it’s not something we focus on from the get-go. You’ve had so many great moments during your time with the Cardinals. Does any year, game or moment stand out in your mind as being particularly amazing? Probably the first year we had a chance to go to the Final Four. 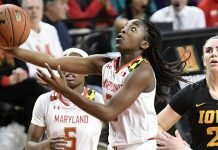 It was bittersweet when we played Maryland in 2008, because Kristi Toliver and Marissa Coleman were freshmen in 2006, and we were competing against them to get to the Final Four. That was a moment for our program that made an impact. Then in 2013 when we got back. I had heard on the recruiting trail that I was being called a one-hit wonder. After (we won) the Baylor game, we had to come back two nights later and beat Tennessee. Last June you signed a contract extension through the 2024-2025 season. What do you love about coaching at Louisville? What is the best thing about coaching? I love the relationships you’re able to build. I’ve had the opportunity a couple times to switch over to the men’s game. It’s never been something that’s attracted me. 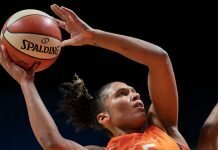 I love watching these players come in as an 18-year-old and leave as a young woman at 22. The difference between an 18-year-old female and 22-year-old female is amazing. It’s amazing to watch their thought patterns, how they rationalize things, think about things. For me here at Louisville, it’s special, because I grew up in Kentucky and am an hour from my parents and my older brother and his kids, who come to games. What kind of a player were you? How did you get into coaching? Not a very good one. I could shoot the ball. I played two years and then I decided to retire, as I like to say. I was not very quick at all. After a brief stint in college basketball I realized this was not going to work out. My parents were like, if you’re not going to play you’ve got to figure out a way to pay for college. So I started to coach the seventh grade girls basketball team at my old middle school. I did that for two years and then coached freshmen girls for a year. I thank my sister, who was national player of the year in 1996, Jaime Walz. I coached her for two summers. Kentucky didn’t have an AAU program at that time. Within two years after my sister graduated, I had decided to get my secondary education degree to be a teacher and a coach. You had five years to start your master’s degree and five to finish. I thought I’d go to Western Kentucky and coach and then get back to that, and that’s how it started. Sanford asked me to go with in to Nebraska, and I was single. I said sure, so that’s how it got started. What did you learn at each of your assistant coaching stops that prepared you to become a head coach at a Power 5 school? I was very fortunate at Maryland; I enjoyed my time with Brenda. She allowed me to be very involved with the X’s and O’s part, so by the time I left I felt very confident in how to run and practice a team. I was fortunate to hire some great people, (like) Stephanie Norman and Michelle Clark-Heard. How does personal and team goal-setting work for you? Our team goal-setting isn’t like we come into a year saying we want to be this or that. Our goal is to be playing our best basketball come March. Everybody’s talking about (our game next week), but I’m not worried about that. We worry about the next game. I love what I do but it’s not my life, and I truly mean that. We get beat last year in the Final Four, and my daughter was devastated in the crowd. When we got back to the hotel room, she wanted to play Crazy 8’s. So there I was, our team had just lost, sitting in a hotel room playing Crazy 8’s. How are you able to blend a busy job with family time? It’s because I’ve got a great staff. There aren’t many days when people are there past 5:30. It’s very important that I watch my kids grow up, and to have them be around my players. If you could tell your younger self anything, knowing what you do now, what would it be? To enjoy the moments more. It goes by so fast. I got great advice from an assistant coach to Marsha Sharp, when she was at Texas Tech. When we went to the Final Four he called and said ‘Jeff, take in this Final Four and make the most of everything. Go to the coach’s social. You’ll have done all of your game prep before you get there, but don’t just sit in your room. Go enjoy it, because it’s not guaranteed you’ll be back.’ I followed that advice at Maryland, and then again in 2009. What will retired life look like for coach Walz in the distant future? Retired life is going to be great. I’m looking forward to spendin it with my family and my kids. I love the mountains in Colorado, and I love going out there in the spring and summer. My kids, my wife and I spent four days in the mountains in Breckenridge this past holiday season doing some snow skiing. I love working in my yard. There are a lot of things that I’m going want to do – it’ll be awesome.